I always like to have puzzles handy for students to work on when they have finished their classwork, or if they completed a test and are waiting for other students to finish, or just for fun! I have 72 science themed scramble puzzles (Scrabble-like) based on Physical and Earth Science vocabulary words. There is a Master List that shows all the words and which number puzzle it is. Each file is saved as the answer, too. 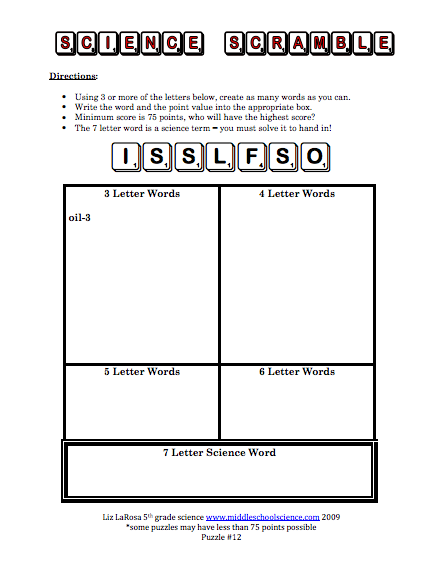 Students can make 3, 4, 5, and 6 letter words and calculate their scores based on the letter values within each word they find. There is one 7 letter science word answer for each puzzle.